328 pages | 119 B/W Illus. Over the last 30 years, hydrographical marine surveys in the English Channel helped uncover the potential wreck sites of German submarines, or U-boats, sunk during the conflicts of World War I and World War II. Through a series of systemic dives, nautical archaeologist and historian Innes McCartney surveyed and recorded these wrecks, discovering that the distribution and number of wrecks conflicted with the published histories of U-boat losses. 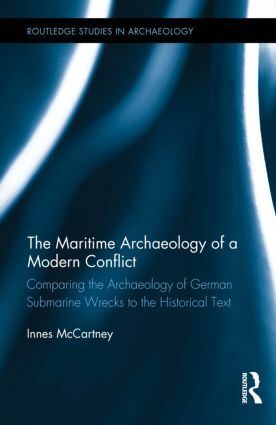 Of all the U-boat war losses in the Channel, McCartney found that some 41% were heretofore unaccounted for in the historical literature of World War I and World War II. This book reconciles these inaccuracies with the archaeological record by presenting case studies of a number of dives conducted in the English Channel. Using empirical evidence, this book investigates possible reasons historical inconsistencies persist and what Allied operational and intelligence-based processes caused them to occur in the first place. This book will be of interest to scholars and researchers in the fields of nautical archaeology and naval history, as well as wreck explorers. Innes McCartney is a nautical archaeologist, historian, author and broadcaster. He obtained his PhD from Bournemouth University and is known for his work in using archaeological research to identify 40 new German submarine wrecks in the waters around the UK and Ireland. He has published in such places as the International Journal of Nautical Archaeology, and SKYLLIS, The Journal of the German Society for the Promotion of Underwater Archeology.